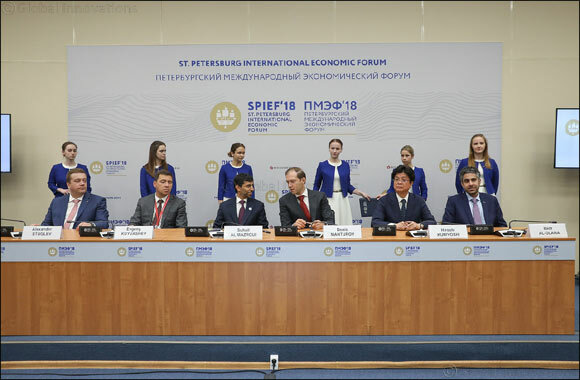 Dubai, UAE, May 27, 2018: The Global Manufacturing and Industrialisation Summit (GMIS) – the pioneering cross-industry forum that aims to unify the world in shaping the future of manufacturing – announced that Russia has secured the rights to host its second edition in 2019 in the city of Yekaterinburg. The announcement was made by the President of the Russian Fedration, Vladimir Putin, during his plenary session at the St. Petersburg International Economic Forum (SPIEF), alongside the President of France Emmanuel Macron, Japan’s Prime Minister Shinzo Abe, Vice President of the People's Republic of China Wang Qishan and IMF Managing Director Christine Lagarde. In his opening statement, President Vladimir Putin added “I urge everyone to participate in the second edition of the Global Manufacturing and Industrialisation Summit which will be held in the Ural region in the city of Yekaterinburg. The focus will be on the use of advanced, promising technologies in the economy, industry and other spheres”. The second edition of the Summit in Russia will intensify the impact of innovation and Fourth Industrial Revolution (4IR) technologies on the global manufacturing sector through the worldwide dissemination of knowledge, best practices, and standards. The Summit, which will be staged in conjunction with the 10th International Industrial Fair (INNOPROM) that will be held in July 2019, promotes the development of a roadmap for the future of manufacturing across the world, with economic and social development at its core. The theme of the 2019 Summit in Russia - one of the world’s biggest manufacturing heartlands - will be 'nature-like technologies’, otherwise known as biomimetic design and biomimicry. The science of mapping design challenges to the natural world to find innovative solutions has led to some of the world’s most important inventions. By using nature to inspire manufacturing innovations, the Summit will promote strategies and designs to deliver solutions that achieve sustainable industrial development. A joint initiative by the United Arab Emirates and the United Nations Industrial Development Organization (UNIDO), the Global Manufacturing and Industrialisation Summit bridges the gap between manufacturers, governments and NGOs, technologists, and investors in harnessing the Fourth Industrial Revolution’s transformation of manufacturing, to enable the regeneration of the global economy. Uniting key stakeholders - including world leaders, industry CEOs, and specialist researchers and academics – the Global Manufacturing and Industrialisation Summit has placed manufacturing at the core of economic transformation and government policy-making, promoting it as a tool for global cooperation and collaboration, and is committed to ensuring the sector supports the objectives of the United Nations Sustainable Development Goals (UN SDGs). The first edition of the Global Manufacturing and Industrialisation Summit was held under the patronage of His Highness Sheikh Mohamed bin Zayed Al Nahyan, Crown Prince of Abu Dhabi and Deputy Supreme Commander of the UAE Armed Forces, at the Paris Sorbonne University Abu Dhabi in March 2017. It brought together over 3,000 government, business, and civil society leaders from over 40 countries to advance manufacturing and industrial development globally, and to identify key trends and opportunities across the themes that can support the manufacturing sector of the future. Its success led to numerous expressions of interest in hosting the Summit’s events and initiatives. As a result, the Russian Federation signed a Memorandum of Understanding in November 2017 to support Russia’s official bid to host the 2019 edition of the Global Manufacturing and Industrialisation Summit in Yekaterinburg. The Summit will continue to build on the momentum created by its successful first edition. It will focus on how, in a world of disruptive change, the role of manufacturing has evolved into a global cornerstone of economic and social prosperity that can be maximised by channeling and capitalising on the transformative, regenerative opportunities that the Fourth Industrial Revolution presents. It will also aim to help steer the future of science, catalyse technological change, promote partnerships, and energise young people around the world to contribute to building stronger and more sustainable societies, communities, businesses, and economies.